The Ohio Veterinary Dental Service works with several police dogs every year to ensure their continued work and success to their departments. In their line of work, the fang teeth can get broken off which leaves the dog in pain and unable to work. Police dogs need their fang teeth to keep up bite work, so we perform root canals followed by the placing of steel titanium crowns. The end result is no more pain and back to work to keep our community and police officers safe. Police dogs are eligible for a free consultation to evaluate their oral health. 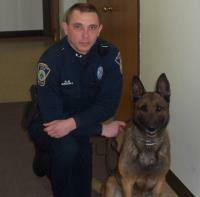 Patrolman Waddell and Quinto have worked together since 2003. Quinto has assisted with countless traffic stops involving illegal drugs and has successfully tracked suspects who flee on foot. Patrolman Waddell and Quinto patrol the streets of a city in Northern Ohio. Quinto can keep working thanks to crowns placed over his broken teeth. Cpl. T.N. Mooney handles Riko, a Belguim Malinois. Riko is a dual purpose working dog and is certified in Explosives Detection and Tracking. Riko fractured his lower right canine in the line of duty. 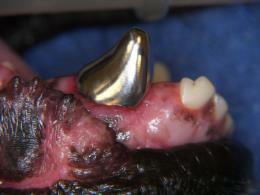 The Ohio Veterinary Dental Service was able to save the important tooth with a root canal and crown. Cpl. Mooney reports that his "new tooth" is working well. Cpl. Mooney and Riko work for a sheriff's department in West Virginia. Riko will be featured on an upcoming Animal Planet Show.